We’ve all been in the situation where we just wish that the other person would shut the heck up, haven’t we? Whether it was a friend, a stranger in the train, or the people in the next table – sometimes people just can’t seem to know when to stop talking. Recently, I heard of stories about a senator covering his hears while a fellow senator was lashing out during a hearing. I bet that he would have given anything to get his hands on a shut up gun! Yes, there is such a thing, although I think that its creators will not choose “shut up gun” as the official name. Japanese researchers have taken advantage of what is known in the field of psychology as Delayed Auditory Feedback. You probably have observed this effect while using Skype, voice on Yahoo Messenger, and other similar services. Remember how irritating it was to hear your voice echo over the line, resulting in you stopping yourself from speaking? That’s Delayed Auditory Feedback in action. What the shut up gun does is basically jam the speech of people using Delayed Auditory Feedback. It makes use of a directional microphone, which picks up the speech of a person more than 30 meters (100 feet) away. 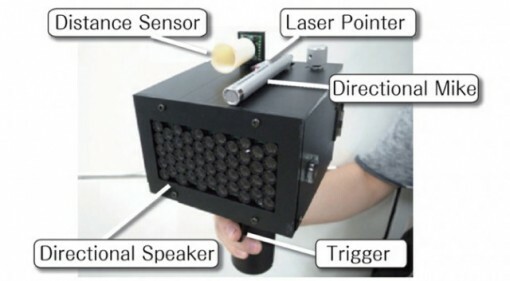 After 0.2 seconds, the shut up gun uses a directional speaker to play back the recorded speech. The library, where silence has always been of paramount consideration, is the main thing that comes to mind as an application for the shut up gun. Forget those irritating little bells that librarians furiously ding when someone speaks loudly. Forget the hushing sounds that librarians make. They’ll just point the shut up gun at you instead! Alternatively, you can take a shut up gun with you whenever you are meeting with people you know who are disruptive conversationalists. When they start interrupting other speakers or just can’t seem to shut their mouths, use the shut up gun on them!